Take Note! Our inventory is fluid and changes on a daily basis. On a busy day we may have 600+ visitors to our farm. We do not inventory daily. Come out to the farm and enjoy the experience of the great outdoors to find your perfect size and type. The season is short, so come early for best selection. Crop selection each year is subject to weather, pests, diseases and individual variety growth pattern. Producing Christmas trees is no easy task, evident in the number of Christmas tree farms in our area. IMPORTANT! ALL visitors to the farm, must check-in before entrance is allowed into our field!!! Making holidays special is a family affair at Fort Osage Christmas. Bring the whole family and create memories to last a lifetime. Experience the hospitality of the Luke family farm. Complimentary candy canes and coloring books for the little ones, hot spiced tea and cocoa, bow saw provided for cutting, complimentary shake and bagging of tree and twine for "do it yourself tie-on". WITH CHILDREN AND PEDISTRIANS EVERYWHERE, 5MPH WHEN ON PROPERTY! We grow beautiful Scotch Pine, White Pine, and Norway Spruce and Virginia Pine. We provide saws. 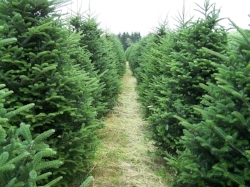 We also offer the largest and most recent cut selection in the metro area of #1 USA Christmas tree Fraser Fir (6'-12' sizes). Quantities of trees over 11' LIMITED. All trees are individually tagged with a price by variety, size, and quality. From Soup to Nuts, knowing everything about our Choose & Harvest Tree Farm. How does a Choose and Harvest Tree Farm work? A Choose & Harvest Christmas tree farm is the place you go if you want the freshest tree, and want to experience a wonderful time outdoors. 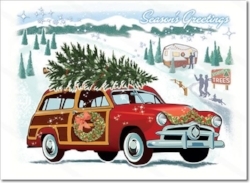 The journey is as simple as gathering the family, driving to the tree farm, parking and checking in at the gift shop. A quick few minutes of explanation, safety do’s and don’ts and you’ll have your hand saw (we provide) and ready to begin the hunt for that perfect tree. Don’t remove any tags, and only cut trees that have tags. Un-tagged trees are not ready for harvest! Like last year, we will tag a few small trees for use as “table top” or for children’s bedrooms. Again, information about what can and cannot be cut is shared with you in the gift shop. Once the tree has been cut down, return the saw and carry the tree back to the processing. At this time your tree will be shaken and bagged for easy transport. Because of liability we are no longer providing tie on service, however we will provide free twine for you to do it yourself. Trees are more easily transported in pick up trucks and in the trunk of cars. Proceed to the pay station, pay for your tree, and then take it home to set up and decorate. Pets are allowed, leashes are encouraged. Clean up after your dog is a must, or someone may drag a tree through it. It has happened. If your pet is at all aggressive towards people or other animals, the tree farm is not a good place for them. Can we choose a tree to save and return at a later date for pick up? Trees must be taken the day of purchase. What kind of payment is accepted? Cash is king, MasterCard, Visa, Discover, AMEX, and checks with proper ID. What is a tree shaker? The tree shaker is a device operated by the tree farm staff to aggressively shake the tree and help remove the dead needles, bugs, and other loose debris from inside the tree. Although we cannot guarantee everything will be removed, it will definitely get the majority of it. This process is highly recommended by the tree farm employees. Typically once a person uses the tree shaker for the first time to shake their tree they wonder why they have never done this before. As a tree grows needles on the inside of the tree no longer are exposed to light, turn brown and fall off. These needles get stuck on the branches and can collect over the lifetime of the tree. Needles inside the tree do not indicate any sort of issue with the tree. A good shake will typically remove these needles leaving a healthy Christmas tree. What is bagging the tree or baling the tree? Netting the tree is a simple way to help haul, load, tie, and set your Christmas tree in its stand. When a tree is netted, it is pulled through a circular tube by the Christmas tree employees pulling the branches tight around the trunk making the tree thinner. Now when you carry the tree, the branches do not drag on the ground, it becomes much easier to maneuver around people, through doors and onto or into vehicles. It also makes setting the tree in the stand much easier. After it is securely in the stand the last thing you do is cut off the net. *Occasionally a few trees are too WIDE, to be pulled through the netter/baler. Trees 12+ cannot be bagged by standard netter/balers. Can your staff cut my tree for me? The tree farm employs several people to help with shaking, netting, hauling and occasionally cutting down a tree if someone is in need of help. If the tree farm is busy it can be a significant wait before someone is available to help cut down your tree. If assistance in needed in cutting down a tree it is best to call the tree farm and find out when a low traffic time to visit would be. How do I keep my tree healthy for the season? The THREE most important things you can do keep your tree fresh and green throughout the Christmas season is make sure it has a fresh clean cut on the bottom of the trunk and to continually water it after it has been put in the stand. The cut is good for about an hour after you chop the tree down. If you do not want to put the tree in the stand when you get home it is recommended to put it in a bucket of water. If it is going to be out of water for a long duration, give it a fresh cut of at least 1" before you put in the tree stand. Once it is in the stand a tree can drink lots of water. Keep a close eye on the water level and do not let it go dry. If it goes dry, the trunk will seal up and will need another cut. Indoor heat is hard on the tree, keep the tree from heat registers, or close the heat register to prolong the life of your tree. Do you flock the trees? No, flocking trees is not a service we offer. However, you can buy cans of spray-on flock and do-it-yourself. Do you sell any pre-harvested Christmas Trees? Yes, we have been providing the greater Kansas City area with fresh Fraser Firs. The high demand for the variety that is typically not grown in Missouri has driven our selection to an all-time high. These trees add more variety to the selection on the farm and allow families an option for a quick in and out visit. When you see media images of Christmas trees most likely it will be a Fraser Fir, the #1 Christmas Tree in America. We have a “harvest agreement” with our grower, to insure the trees come straight from his field to ours, and have provided the freshest trees in Kansas City for over a decade. With proper care these trees last well into January. When you select one of these beautiful trees you are helping your farmer. The demand for cutting trees far outweighs the speed in which trees can be grown. It takes 7-8 years to produce a Christmas tree of 7 ft Everyone loves to cut, but consider one of the fragrant beautiful Frasers! Can I do some session photography on your farm? Session photography details at whitepinewedding@gmail.com . Do you paint your trees? All Christmas tree farmers not growing in the north, must use a sunblock colorant. This ensures a beautiful dark green color to pines that experience a natural yellowing process in late fall from ultraviolet rays. The color will not wash off, fade, and is harmless to trees, people and pets. Question: Do you import trees that cannot be grown in Missouri? Question: Can we cut trees? Answer: Yes, a limited number of trees can be harvested from our field. Growing a tree to 6 foot takes 6-8 years and people flock to harvest a fresh tree. Don’t be disappointed early! We will post on our fb page when the fields are closed for cutting. Question: What do your trees cost? Answer: Our trees are first priced by height and then by quality. Trees would range anywhere from $30.-$275. Question: Can I pay for a tree and pick it up at a later date? Answer: No, trees must be taken on the day they are paid for. Question: What features do you have on your farm? Answer: We have a gift shop fully stocked with gifts, lights, ornaments and tree stands. We serve complimentary Hot Cocoa and Spiced Tea. We give little candy canes and coloring book to each child. We have three different Christmas scenes for taking a snapshot with your family to capture your shopping experience. We have an outdoor bonfire if it’s not too windy, we have a wood burning stove in our gift shop. We shake and bale your tree. We no longer tie on tree for liability reasons. We will provide twine. We do not have hayrides or sleigh/carriage rides. Question: Do you allow professional photography sessions? Answer: We charge $75. for a minimum two hour session per photographer. All sessions are private invitation only. We live at the property. Session availability is limited. Question: Do you have restrooms? Answer: We BRAND NEW INDOOR RESTROOMS!! Question: Is your farm wheelchair accessible? Answer: The farm has “chip and seal” coated roads, and fields have stumps and dips and other natural occurrences of a working farm. We would not discourage anyone from coming, but it may not be user friendly for some. We have wheelchair accessibility entrance into our lodge, and handicapped bathroom. Question: Does Santa visit the farm? Answer: Yes! See calendar for dates and times. Question: What type of payment do you accept? Question: Do you have wreaths? Answer: Yes, we have fresh wreaths and swags. We do not have garland. Question: Do you sell pine boughs/greenery?